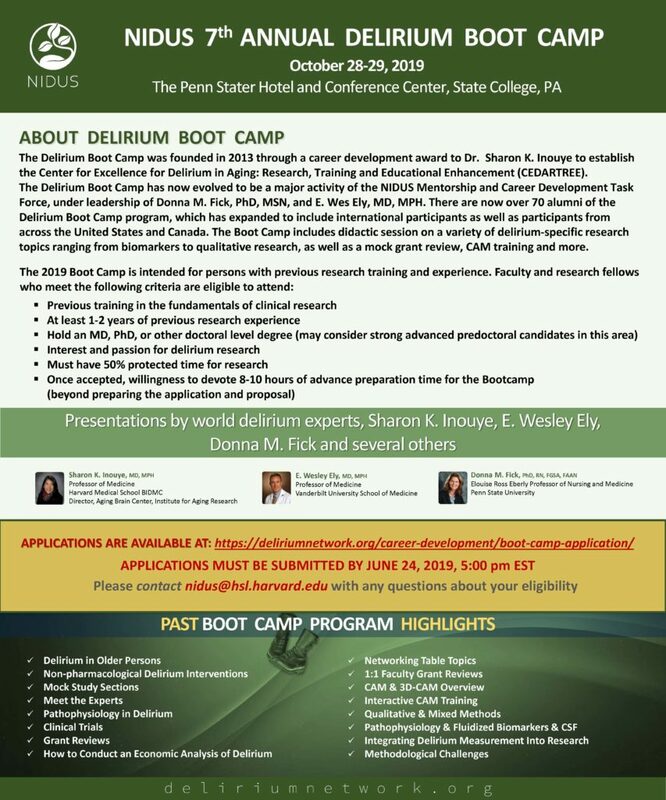 The Delirium Boot Camp was founded in 2013 through a career development award to Sharon Inouye to establish the Center for Excellence for Delirium in Aging: Research, Training and Educational Enhancement (CEDARTREE). The Delirium Boot Camp has now evolved to be a major activity of the NIDUS Mentorship and Career Development Task Force, under leadership of Donna Fick, PhD, MSN, and Wes Ely, MD, MPH. There are now over 70 alumni of the Delirium Boot Camp program, which has expanded to include international participants as well as participants from across the United States and Canada. The Boot Camp includes didactic session on a variety of delirium-specific research topics ranging from biomarkers to qualitative research, as well as a mock grant review, CAM training and more. More information about the Boot Camp and how to apply is available here: https://deliriumnetwork.org/career-development/boot-camp-application/ . Due to limited space, participation is by application only. Applications are due June 24, 2019.